I have noticed that in Newcastle the traffic lights are not coordinated so that traffic flows readily along the main arterial roads. It is also not uncommon to sit at lights waiting for a green light while noone has right of way through the lights, yet traffic on three feeder directions is held up. This can get very frustrating and is possibly a contributing factor to the reason why road rage seems to be worse here than it should be considering the comparably small amount of traffic in Newcastle. I lived in Sydney for 11 years and commuted to work by car for many of those years and I found that, while Sydney traffic is heavy in comparison to here, it is much better regulated in that it moves quickly and it is unusual for cars to be waiting at lights with no traffic flowing through the intersection. Drivers are also much more courteous to each other, and when a lane runs out, other drivers will let the stranded car into the next lane, which also helps greatly with the flow of traffic. Here in Newcastle, it is pretty much everyone for themselves in such situations and that, combined with the poor traffic light coordination, means that driving in traffic can be particularly frustrating. Maybe that is why there is such a “war” between motorists and cyclists here – it is contributed to by the general frustration of driving in traffic. I have read on LGRAB about “jerk season” and we have this phenonenon also, but here it is year round as our winters are not so cold that drivers will not roll down their windows to yell abuse at cyclists. I have copped such abuse on a few occasions, for no reason other than riding along on the road in a perfectly legal and reasonable manner, though I haven’t had things thrown at me as some have reported on other blogs. The point I am trying to make here is that the infrastructure we all have to deal with everyday may be making things more frustrating than they have to be and that this contributes to the ill will that exists between different users of the roads. This entry was posted in Uncategorized and tagged infrastructure, newcastle, street cyclist, Sydney, women on bikes. Bookmark the permalink. Maybe we bike riders should wave white flags as we ride around! Agree about the infrastructure. Council painting a picture of a bicycle on the road in the car-door lane then calling it a bicycle lane and expecting us to use it is a classic example of that. The narrowness of some roads doesn’t help. The worst to places for getting abuse from motorists are Hunter Street/Maitland Road (behind the Catholic Schools Office, opposite Fantastic Furniture) and anywhere along Bridges Road, New Lambton. I’m jack of the cut-offs, horns and abuse. 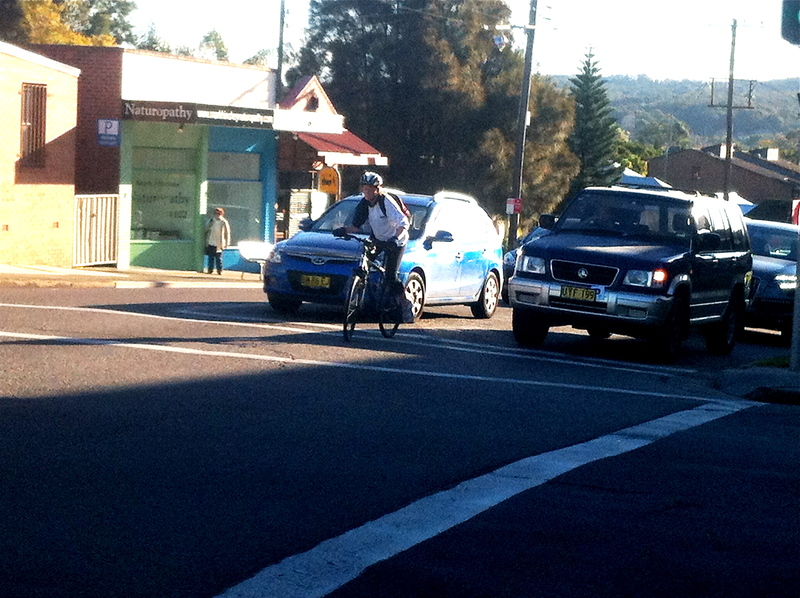 And I agree about Newcastle drivers – they’re less courteous to one another, let alone cyclists. Mark, this comment went into my spam queue which I just checked, sorry for the delay in posting it. It’s good to hear I am not alone in my observations and thanks for the heads up about where to avoid the abuse, I copped a torrent of abuse in Beaumont St one day near the rail gates and as a driver I have had some pretty awful things happen too, so it is not just us cyclists who cop it.